There comes a time in college where you can tell that you're getting older. It may happen overnight, it may be a series of small changes over time, but it happens eventually. Maybe you wake up one Sunday morning and BAM, you can't bounce back like you used to, or maybe the thought of staying in and eating your weight in pizza on a Friday night is more appealing than another house party. You just can't avoid it. 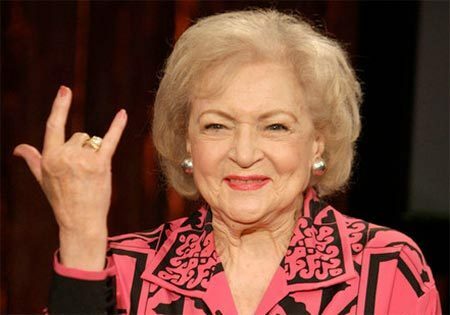 But you can age with grace and dignity, and if you don't believe me, just look at Betty White. 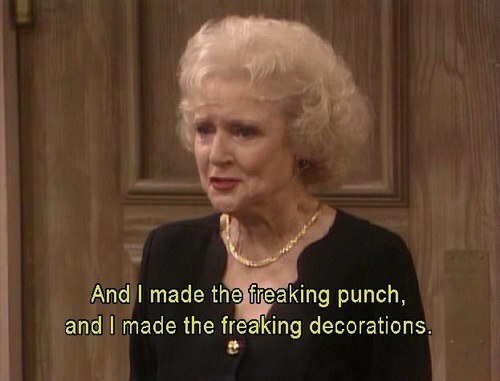 She's 93 and still killing the game, and with every passing day I start to identify with her a little more. 1. When you have to push past freshmen at parties. 2. When you think about graduating. 3. When you throw a party and randos make a huge mess for you to clean. 4. When all of your friends are wifed up. 5. When you and your friend's song comes on in public and y'all just don't care. 7. When a drunk stranger starts crying to you and you don't know what to say. 10. When a freshman asks you and your friend for directions and you send them to the other side of campus. 11. When your professor calls on you and your hand wasn't even raised. 12. When your family asks you about your social life at college. With age comes wisdom, and a little bitterness, too. But as you navigate through those final semesters of college, if ever you're in doubt, just ask yourself WWBD? 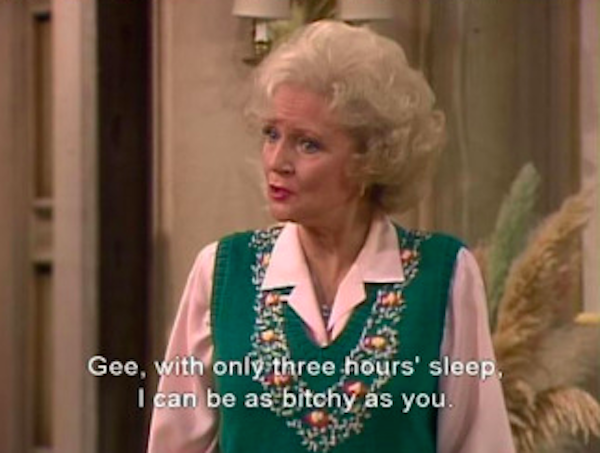 And if you follow the examples set by Miss White, you too will be able to make it to graduation with the same class and sass that Betty has offered the world for almost a century. Because low key who doesn't want to know more about me-- amiright? If you can't tell: I have writer's block. Which is fine, totally cool, we can work with that! BUT also prettyyyy annoying. ANYWAY. Who doesn't like hearing about somebody's day (only if you low key hate the person but that's okay-- a valid feeling!!) -- about the way someone woke up, the thing that they ate for lunch or even their night routine (which I promise I'm not going to torture* anyone to THAT hell, but also because I don't even have a night routine! Amazing but also sad because lack of consistency!). So today, as a Wednesday (Wednesday was when I wrote this, two hours before my article deadline, don't judge me), was a bit of a busy day. When I say busy-- usually waking up at like 7:30 or 8 AM (IF I can wake up, which big mood) and ending (not really) at 9 PM and then studying/doing work/textbook readings/last minute articles (hello!) until like 2 AM. Which is late (sorry roomie!! ), but that's college! With that said, today I actually woke up at 9 AM and thus did not go to my first class-- which if my sister reads this and tells my mom I will literally come back to Utah and slap her. Anyway I quickly took a five minute shower (TMI! ), which is surprising since I can never do that usually but that's okay, improvement! I got dressed (internship ready!) and while I was putting mouse in my hair, I remembered that I have a take home quiz due for my next class (at 10 AM) that I have not done yet-- which I promise you, I am a procrastinator, but not that big of a procrastinator. Anyway I sat down, turned on my laptop (which is broken by the way, thanks HP laptops) and kind of finished my assignment in 10 minutes but left two questions unanswered, but like live life on the edge, amiright? I finished getting ready, which wasn't much because it was already like 9:50 AM and I needed to go so I pretty much just finished applying mascara and filling in my brows and grabbed the PB&J; from the fridge that was supposed to be dinner yesterday which wasn't, but that's another story, and grabbed ONLY my keys (foreshadowing! ), locked my apartment door, ran down the stairs and got on my bike! And let me stop here and tell you how much I love my bike. Without my bike, I would be late for everything and plus I hate walking. Also because my apartment is kind of far from campus (not really but everyone tells me it is) and with my bike only takes about 5 minutes to get to class. Remember the foreshadowing? As I was riding my bike and almost halfway there (to be honest I could've turned back but I'm lazy), I realized that I forgot by ID, which I need to check out a laptop from the library (because my laptop is broken, thanks again HP who supposedly fixed my laptop before for the same problem but here we are again) and to also just live my life as a USC student (meaning to get into the library and to also get into my apartment building). But I thought, it's chill, we're fine, we're late so let's focus on the issue of getting to class on time. So I crossed that big intersection to enter USC and went up that ramp thing by VKC (USC people will know), parked and "locked" by bike (my bike lock doesn't really work because someone can easily pull it off my bike and yeah) and speed walked to class (which means going up the stairs which is also when I realized that I wore the wrong shoes because my flats almost slipped off TWICE) and got to my classroom exactly at 10 AM. And this all happened within 10 minutes -- see what I mean about my bike being a literal gift from god (kidding, but also not)? Anyway I got to class and the professor isn't even there so I could've literally filled in my eyebrows a bit better but whatever. At this time I was also regretting not going back for my ID so that I could at least rent out a laptop and continue reading research articles for my essay due in less than 2 weeks (!) while the professor lectures (sorry, but like if it's not on the final, you've lost my attention). But since I didn't have a laptop at that time, I went ahead and took a picture of my textbook readings which for the record I didn't end up reading and pretty much wasted space on my phone and wasted like 2 minutes of my life but it's okay! Anyway the Professor arrived (at 10:02 AM) and she started setting up her laptop while I decided, hey, maybe I should finish those two other questions that I didn't answer in the take home? So I did that and ended up changing my answers and had enough time to spare before we actually turned it in! It goes to show you that procrastination actually does work!! The class is also actually pretty cool! It's a class on traditional Chinese medicine (which I honestly don't know why I'm taking since I'm a POLITICAL SCIENCE MAJOR), that includes acupuncture. Which, honestly is something that I was apprehensive about, but it's actually pretty scientifically sound (from the few studies out there) and most importantly has seemed to benefit patients (which I have seen in real life!). Today the professor just went over the nutritional side to eastern medicine, and what I found interesting how each color and taste to a food pertains to a specific body part and even deficiency! If you haven't noticed by now-- this is really long. And I'm barely at like 10:15 (to be honest, less than that). But it goes to show that even a morning can be somewhat interesting-- or I don't know maybe it's just me! Anyway, this might be a several part series where I describe the rest of my day but maybe not! Probably just something for writer's block!